This class curriculum is designed as a school elective that meets daily for 50 minutes for 1 semester. The class reinforces academic standards for reading comprehension and analysis, and writing. 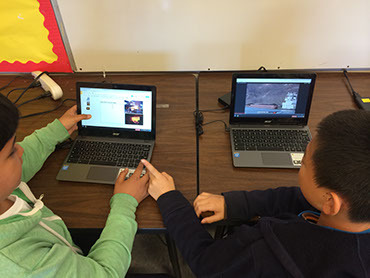 Development of technology and design concepts like editing videos, telling a story using photos, and tools needed to be a citizen reporter. 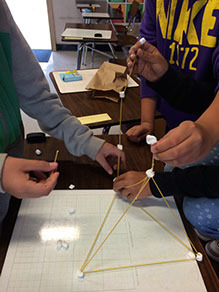 Common Core Standards such as collaborative discussions, demonstrations and presentations, and the brainstorming and development of ideas are encouraged in class activities. View curriculum. directions: collaborate via the cloud to create a presentation using mixed media to clearly explain the innovation the group has chosen and how it has affected you. Staff trains teachers on the technology skills necessary to teach and facilitate the class. 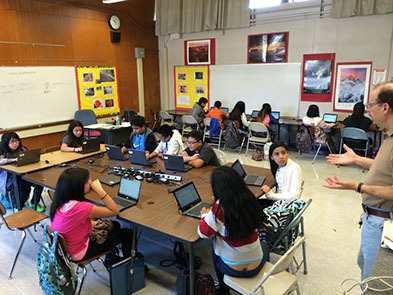 Technology confidence is important before taking a leap into our innovative curriculum. Staff supports all the teachers' needs and adjusts curriculum to be sure all material is up to date. Build the tallest free standing structure using dry spaghetti, marshmallows and tape. Starting a Class is easy, fun and rewarding.